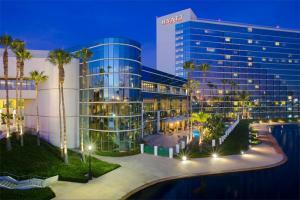 Ideally located on the waterfront, adjacent to the Long Beach Convention and Entertainment Center, the stylish Hyatt Regency Long Beach puts the very best of the city at your doorstep. Its combination of sophisticated style and comfort appeals to vacationers and event attendees alike. All 528 guestrooms and suites offer city, ocean or harbor views from a chic, ultra-modern setting. Elevate your stay with a Regency Club upgrade and get exclusive amenities such as access to the Lounge with food, premium beverages and snacks all day. Make any event, especially weddings, even more special at the only waterfront ballroom in Long Beach. The hotel features a heated outdoor pool and whirlpool, a fire pit, a 24-hour gym, a restaurant, and a sundry store. Pets are welcome.